Break the asparagus spears with a gentle snap to free the tender tops from the tough part of the stalks. Steam in a quarter-inch of simmering water, covered, for 3-5 minutes. Rinse under cold water and drain. Heat a nonstick skillet over medium to medium-high heat. Add the soy sauce, rice wine or white vinegar, fresh ginger, sugar and oil. Heat to a bubble. Add the asparagus and coat with the dressing. Sprinkle with orange zest and sesame seeds. Serve the asparagus on a warm bed of lettuce. Garnish with orange pieces and sliced red onion. In Recipes-list.com we have selected the most viewed recipes from category - uncategorized . Enjoy the best recipes specially selected for you! 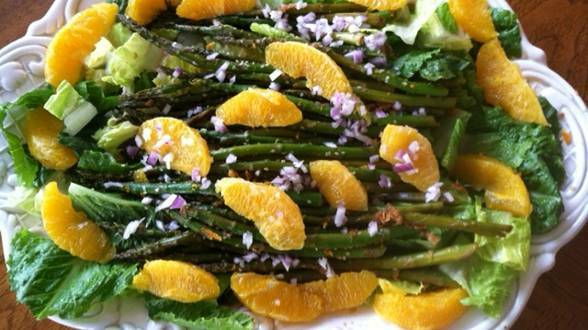 Asparagus Salad is the right choice that will satisfy all your claims.